Slums are the quarters in major cities, where the poorest people live - those who do not have money for a more dignified housing. In Bangladesh, the slums usually consist of simple shelters made from bamboo, pieces of metal or plastic foils, where the whole family lives in several square metres. For more pictures visit our photo gallery below. How is it with education in the Slum of Chalantika? More than half of the adults in Chalantika are illiterate, they have never attended school. The majority of school aged children cannot attend school as well, and if so, only irregularly. 2. Families do not have money for school equipment and fees. Another reason why the parents from Chalantika do not send their children to school is the lack of finances related to schooling needs such as school equipment, textbooks, uniforms, and school fees. These are the items which the families cannot afford, aside from rent and for food which something above-the-standard they have no money for. An important factor is also the fact that children often have to work and contribute to the family budget from an early age. Commonly, they carry out auxiliary work in textile factories or at markets, collect recyclables, beg or take care of younger siblings and the household. Despite the fact that child labour is officially banned in Bangladesh, the number of working children in Bangladesh is one of the highest in the world. Poverty is the main reason for child labour. Due to the absence of pre-school education, poor financial situation of the family and work obligations, the children of Chalantika cannot often even start to attend school, let alone continue and complete basic education. To get the opportunity of education for these children became the same as the opportunity to fight against poverty and represents a chance for a better life than their parents live. How the life in the Chalantika slum looks like? The slum is formed by simple dwellings made of metal sheets bound by bamboo scaffolding, which stands in the water. This "pond" in the middle of the big city is full of garbage and sewage from slum and from neighbouring multi-storey buildings. Slum shelters are stuck on each other, line after line. More than 12 thousand people live there, each family occupies max. 5 – 10m². There is neither drinking water nor a functioning sewer system. Families share the common latrine, they need to bring industrial water in barrels from a few stations scattered at slums. Meals are prepared in ovens made from clay soil, fire is made from anything that burns. The most common employment of adults: worker/sewer in textile factories, domestic assistant, rickshaw drivers, labourers at construction industry and road sweepers. Children routinely perform the following work and duties: working as small vendors at marketplace, vegetable porters, shoe cleaners, beggars, assistants in textile factories and at construction sites, or they take care of younger siblings and the household. The average monthly income of the head of the family is around 1,400.00 CZK (approximately 47.00 CZK per day = amount of which the whole family must often make ends meet). Residents must pay rent, which make up to half of the family income. In Bangladesh, Chalantika is nothing exceptional - it is "just" one of the five thousand slums in the capital, Dhaka. Dhaka ranks among the top twenty of the largest cities in the world and among those of the most populated. 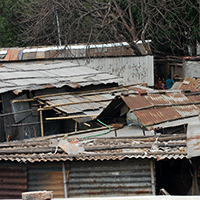 There are approximately five thousand slums – poor quarters. More than five million people call them a home, over one half of them is children. They come often from villages with the hope of a better life and with the vision of a job that will help them to earn livelihood for their families. The reason why they come is mostly the poor harvest of their small fields or the floods. Soil erosion or seasonal famine drives people to the cities, where the promise of some earnings is often the only way to survive. However, due to high urbanization, the cities of Bangladesh cannot sustain such an influx of people coming each year. The slums are therefore expanding, filled by poor families. Slums that often lack the basic hygienic facilities, access to drinking water and the possibility of education, are full of families that do not have money for a more dignified housing, and children, who spend time collecting plastics, begging or working to help their families to survive. 65% of the population has no access to drinking water or toilet. 2/3 of the children are suffering because of malnutrition. 90% of the slums families live for less than $ 25 per day. More than 1/2 of adults cannot read or write. 4 out of 5 children do not attend school at all, and if so, only intermittently. For these children, the opportunity of education is becoming an opportunity to break the circle of poverty and a chance to have a better life than their parents.